Your ONE BEST investment technique for producing monthly income! “The Monthly Income Machine” Option Credit Spreads and Iron Condors… Done Right! Don’t insult my intelligence by painting me those infomercial pictures of a mansion, surrounded by impossibly beautiful ladies lounging around the pool overlooking a red Ferrari in the driveway. The foundation of the “Monthly Income Machine” is a comprehensive how-to book, a definitive manual for conservative investors seeking high income. In addition to the clearly spelled out “rules” for trade entry and management detailed in “The Monthly Income Machine,” you will have direct access to the author/developer of “Monthly Income Machine.” He will be with you every step of the way on your road to producing a welcome income stream. In addition to the book itself, you will also receive the ongoing series of how-to “white paper” article and book updates, and personal coaching by the author should you have any questions. Properly designed option credit spreads, and the supremely efficient Iron Condor credit spread, can be the best path to meaningful monthly investment income. The Monthly Income Machine is the distillation of much of what I’ve learned during my 30 Wall Street years. The bottom line is that after you finish the book, you will be able to use the same “one best investment technique” yourself to intelligently, safely, and confidently seek a fresh supply of meaningful income every month. My name is Lee Finberg and I’ve spent the last 30 years investing for my own accounts and with Wall Street firms as a broker, Branch Manager, and former Vice President – Investments with Paine Webber and Prudential Securities. How can a monthly return target of as much as 8% be the product of a conservative trading plan? It can be. And it is. We use a special combination options technique – with tight, proprietary trade entry criteria and robust trade adjustment techniques – designed to produce a high probability of success on each trade, every month. But obviously, no one can “guarantee” profits. Any trade carries risk and can result in a loss of money. See full disclainer here. Unlike traders making outright purchases of out-of-the-money options who seek a very high rate of return with a low probability of success, each of our Monthly Income Machine positions focuses on achieving a high degree of probability of producing profit. the system’s very specific “entry criteria” and trade management techniques for just one class of investment vehicles: the credit spread and the related double credit spread called the Iron Condor. making certain that your brokerage account is with an “options-friendly” brokerage firm (firms that are not options-friendly will require margin for both sides of the aforementioned Iron Condor – thus cutting your rate of return in half!). Some of the money they lose goes to someone! That “someone” is the knowledgeable income investor: Me… and You if you arm yourself with the correct tools and use them systematically. Each month, you will be able to identify appropriate trades, and enter your orders for that month, in about an hour or so. I most emphatically do use it myself. In fact, after three decades of professional market involvement as a broker and financial advisor, it is the ONLY investment technique I now use for my own accounts. For three decades I’ve worked with and advised clients with all types of trading accounts throughout the U.S. and abroad – from small speculative accounts to the large accounts of Chairman of the Board of a worldwide hotel chain and of a major oil production giant. I‘m confident that I know what really works… and what doesn’t. The investor who believes simply buying high-dividend stocks and holding them through thick and thin will produce the safe income stream he wants will often suffer disappointment. In my experience this can be a head-in-the-sand investment philosophy that can, and sometimes does, produce disastrous consequences. (Currently, think Enron, AIG, Lucent, Fannie Mae, etc.). The soft-cover and digital (e-book) versions of the book include the identical step-by-step “entry criteria” and trade management techniques I, and the SaferTrader community of income seekers, use to generate a stream of monthly income. I will be available, as part of your included SaferTrader membership, for some direct consultation with you via email to answer your questions and even to review your contemplated “machine” trades. In addition to the Monthly Income Machine, SaferTrader participants will automatically receive my specialized how-to reports covering less widely known, extremely powerful guides to capturing additional low-risk market revenue. 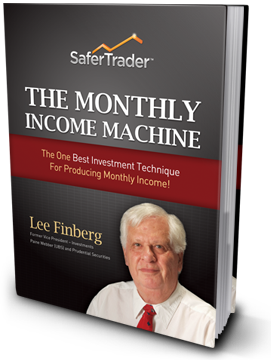 If within 60 days you do not find the Monthly Income Machine and related SaferTrader community program benefits exactly what you needed, just let me know, return the book, and your purchase price will be refunded. Now after 60 days, if your Monthly Income Machine results do not convince you that you can earn substantially increase your current income every month, I insist you send the program back… and we will promptly issue you a full, no questions asked, refund. Simply put: you make the income, or you don’t pay a single penny. Even though we must always be on the “sell side,” we never simply sell “naked options” short. That’s because the naked short approach is high-risk in the case of Call Options. 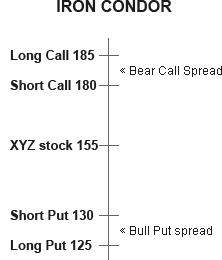 Instead we sell carefully constructed spreads thereby producing lower-risk trades with low margin requirements. You simultaneously SELL one option and BUY one option with a different Strike Price on the same underlying stock or index. (The one you buy is simply there to protect the one you sell, and to greatly reduce the margin requirement). That means that instead of trying to predict a short-term future price direction for the underlying stock or index, we base our credit spread trade selection on prices we believe the underlying stock or index won’t reach by next month’s option expiration day. This will absolutely occur so long as the price of the underlying stock or index does not reach the Strike Price we initially established as very likely to be “out of reach” by option expiration day. Think of The Monthly Income Machine as your recurring trip to Income City on autopilot… and it even comes with a co-pilot (me). Once we have determined what stocks, ETFs, or indexes are potential candidates for our credit spreads and/or iron condors based on the Monthly Income Machine rules, we need to determine what Strike Prices to use for the options that make up the spreads. Importantly, we want to use Strike Prices that are so far above or below where the market is now, that there is only a slim possibility that the underlying stock or index can reach these prices prior to the month-end options expiration day. But “distance from the market” is not nearly enough; the Strike Prices chosen must also meet Monthly Income Machine requirements for amount of premium to be earned, among other criteria. That price level we determine to be “well out of reach,” and thus the basis of a contemplated credit spread, is one of the trade “entry criteria” spelled out fully in the book. Two trades using your monthly income entry criteria required the roll technique you described in the managing the trade chapter. All the rest went exactly as planned at the outset. Results so far are 8.16% average monthly return. Thank you! !” Howard N., New York, N.Y. Which stock, ETF, and stock Index options should you consider for your income trades? The entry criteria for spreads on individual stocks differ from those we use for indexes like the S&P, Nasdaq, and Russell Small Cap. If there is such a possibility in the news, it’s also a disqualifier as a Machine trade. If it’s below a certain figure, we stop here because the trade fails the entry criteria test. If it does qualify, we move ahead with the checklist. Does the underlying stock or Index meet our specific minimum volatility requirement (we want options whose underlying stock is sufficiently volatile as to offer us an acceptable premium). When the Monthly Income Machine trade being considered meets ALL of the entry criteria, the trade will have a very high mathematical probability of success… meaning that there will be a strong likelihood that the options in the credit spread will expire worthless on the third Friday of the month… which is exactly what you want. It’s yours with no risk. Bank the income or send the book back. And let me hear from you! I look forward to adding your story to the many testimonials I’ve already received. Specify desired book format below – physical book or e-book (digital download) version. Also available at Amazon. Same price, but only orders placed at this SaferTrader site include choice of physical or digital (e-book) version of the book, free access to members-only FORUM, as well as Lee’s “white paper” series of articles covering professional tips for enhancing rate of return. Important: Checks and money orders must be in US Dollars only. 3. Don’t forget to add Shipping and Handling to the cost of the program. Author’s Additional Disclaimer: The information contained in this book represents methods I have developed and use personally, but I cannot and do not guarantee that you will make money, or that you will not lose money, employing the techniques, strategies and markets discussed herein. I am no longer a registered financial/investment advisor/broker and am not part of any investment firm except as a client trading my own accounts. You should not trade any market, any methodology or any system with funds you cannot afford to lose.